The Tremp Valley is an area of vineyards with a great wine tradition. During the last twenty years a new generation of wineries has sprung up, committed to quality and detail. Castell d’Encus, exemplary winery of the territory, occupies a privileged space and uses some of the same methods of winemaking used by the hospital monks in the same natural environment in the twelfth century. 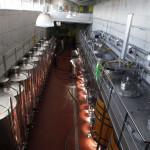 Sauvella, a natural and ecological winery that creates premium quality wines. You can visit Mas Garcia Muret, Sauvella, Vila Corona, El Vinyer, Licors Portet… and microbreweries of craft beers and enjoy their flavours.